While the world's fantasies were caught up in the marvels of aviation , baseball dominated the sports pages, labor movements world wide were gathering strength and the suffragettes got a "shot in the arm" if you will with Marie Currie winning her 2nd Nobel Prize, American Golf emerged from its infancy in 1911 with J. J. McDermott becoming the first American to win a US Open Golf Tournament. January 1911 "Indoor golf fever" grips Chicago area. Among those golfing wizards participating is Western Open Champion Chick Evans. January 1911 Mr. Horace G. Hutchinson, British oracle of all things golf proclaims The Country Club in Brookline Massachusetts "amusing but too short"
January 14, 1911 The United States Golf Association at its 17th annual meeting "legalizes" the use of center shafted putters, commonly known as "Schenectady Putters"
January 14, 1911 Travis, Evans, Phelps and Egan play what may be the Greatest Indoor Golf Match of all time. January 1911 The Handicap Committee of the Golf Association of Philadelphia has released its list of members, there are no scratch players, and A. W. Tillinghast, golf course architect is sporting a handicap of 6. January 1911 MacDonald Smith finishes 2nd in the San Francisco Claremont Country Club Open Tournament. January 1911 H.H. Barker has designed 2 more golf courses opening in Atlanta, Druid Hills and Brookhaven CC. January 1911 The annual mid-winter tournament at Pinehurst had a record 158 players. January 1911 Ben Sayers is now head professional at The Golf Club of Monte Carlo. Ben enjoys a "golfing wager" making him the ideal man for the job. January 1911 The new course at Hot Springs (Ark.) Golf and Country Club was completed at a cost exceeding $40,000. February 11, 1911 Walter Travis won the 7th Annual St. Valentine's Tournament at Pinehurst defeating B. T. Allen of Fox Hills in the final. February 1911 The Massachusetts Golf Association assumes the running of The Greater Boston Interscholastic Tournament. February 1911 Connie Mack, manager of the world champion Philadelphia Athletics endorses golf for baseball players. February 1911 The Golf Association Of Philadelphia now has over 700 players with handicaps ranging fro 5 to 17. They proclaim their 5 to be equal to the Metropolitan Golf Association's scratch. February 1911 The Detroit Golf Club was selected to host the Western Amateur July 22-29. February 1911 The Western Golf Association announced it added 26 clubs in 1910 bringing total membership to 150 clubs. February 1911 The Wisconsin State Golf Championship will be played at Kenosha Country Club August 2-5. February 1911 Walton Heath in Surrey UK will be hosting a partners tournament in May. 1st prize will be $1750 to the winning team. it is expected to attract many top professionals. March 1911 The Board of Governors for Stanton Heights Golf Club of Pittsburgh, Pennsylvania have decided in view of the great amount of trouble with caddies to take action. March 1911 The Woodland Golf Club in Auburndale Massachusetts (home course to Francis Ouimet) has rebuilt its locker room and reports its course in excellent condition. March 13, 1911 Mr. Walter L. Fisher, an avid and accomplished golfer has been appointed by President Taft to the position of Secretary of the Interior. Some circles report him as the "new addition to President Taft's golfing cabinet." March 17, 1911 Golf Illustrated publishes an article thrashing certain Canadian golf clubs for joining the Western Golf Association. March 20, 1911 Miss Mary Fownes of Oakmont, sister of US Amateur Champion W. C. Fownes Jr. was low qualifier with a 93 at the 1911 Women's North and South Championship. March 24 1911 Miss Louise B. Elkins of Oakmont defeats Mrs. Wm. West 2 and 1 to win the 1911 Women's North and South Championship played at Pinehurst. Ladies can you imagine playing golf in this the outfit Miss Elkins wore while winning the 1911 Women's North and South Championship. Although it was early spring in Pinehurst. Photo from The American Golfer. Miss Elkins makes Patty Berg look risqué. March 25, 1911 Mr. R. H. Connerly defeated Wilby Porter for the Texas State Championship at Houston CC. Mr. Connerly was also low qualifier with a score of 79. March 27, 1911 Gilbert Nichols won the North and South Open Championship at Pinehurst. March 28, 1911 Walter Travis was low gross qualifier for the North and South Amateur Championship with a 36 hole score of 149. April 1, 1911 Chick Evans defeated Robert Hunter 6 and 5 to win the North and South Amateur Championship. April 1911 Wellesley CC joins the list of new Massachusetts golf courses. April 1911 The Western Pennsylvania Golf Association now has more than 300 players with official handicaps. April 1911 The Skokie Country Club of the Western Golf Association dropped a special assessment of $25 on all its members to off set an alarming deficit of $4500.00 built up over the previous season due to extensive improvements. April 1911 The Metropolitan Golf Association, with 7 clubs not reporting, shows 570 golfers rated scratch to 9 handicap. Notables include J. D. Travers at 2, Fred Herreshoff at 1, and Walter Travis being the lone scratch player listed. April 1911 The Spring Tournament at Pinehurst has established a record for the most players with 227 starting the tournament. The Trans-Mississippi Annual Tournament still hold the record for the most paid entries at 260. (56 failed to start). The Pinehurst tournament experimented quite successfully with 1/2 the qualifying rounds being played on Pinehurst 1 and the other half qualifying on what is now the infamous Pinehurst No. 2. April 22, 1911 Mr. Walter Travis defeats Mr. Fred Herreshoff on the 19th hole to win the Spring Tournament at Lakewood, New Jersey. April 29, 1911 Chick Evans sailed for England today with plans to play in the British Amateur Championship at Prestwick in May. 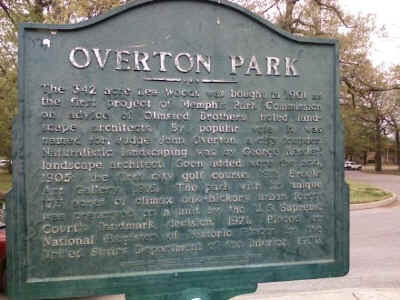 April 1911 Memphis becomes the first city in the south to open a public golf course. Laid out by W. C. Sherwood the professional at Memphis CC, the 2700 yard nine hole course is being built in Overton Park. April 1911 The handicap list for the Massachusetts Golf Association now has over 3000 players from scratch to 24. April 1911 The Massachusetts Golf Association announced a change it date for the Massachusetts Amateur Championship. It will now be held September 4-8 at the Essex Country Club in Manchester, Massachusetts. May 1911 W. E. Shackelford was the winner of the CC of Atlantic City spring tournament defeating A.W. Tillinghast in the final 6 and 4. May 1911 President Taft and Vice-President Sherman both make trophy presentations at the first Chevy Chase Invitational. June 1, 1911 Massachusetts Golf Association Handicaps for May have been released,18 year old Francis Ouimet of Woodland Golf Club is sporting a 3 handicap. June 1911 The Western Golf Association announces their official handicaps, Mr. Charles Evans Jr. of the Edgewater Golf Club in Chicago is deemed scratch. June 3, 1911 Jerome D. Travers wins the New Jersey State Championship defeating Mr. Oswald Kirkby 5 and 4 in the final 36 hole match. Mr. Kirkby was considered a fine amateur player winning the New Jersey title twice and the Metropolitan Open 3 out of 4 years. June 1911 Mr. Max Behr, 1909 New Jersey Amateur Champion, US Amateur runner-up, and future editor of Golf Illustrated Magazine establishes a new course record at Baltusrol Golf Club shooting a 73. June 24, 1911 Mr. Robert S. Jones won the Ohio State Championship and its massive silver cup at the Cincinnati Golf Club. It was Mr. Jones's first state tournament. Holden Wilson was the medallist. June 24, 1911 The Detroit Golf Association completed its first ever tournament. J. B. Schlotman won the city championship. June 1911 John Braid and Arnaud Massy humiliate Mr. "Chick" Evans and Mr. John Ball in a four ball professional-amateur match held just prior to the British Open winning 6 and 5. The score does not truly reflect the beating the professionals put on Mr. Evans and Mr. Ball. June 1911 "Chick" Evans is eliminated in the 5th round of the British Amateur at Prestwick by the left handed Tasmanian Champion Mr. Bruce Pierce. June 1911 Harry Vardon announces his 1912 tour of Australia. The where, when and whom he is going to play will determined by the Australian Golfing Union. June 24, 1911 J.J. McDermott becomes the 1st American and the youngest golfer to win the U.S. Open by defeating (with a score of 80) Mike Brady and George Simpson in a 18 hole playoff at the Chicago Golf Club. This is the second consecutive 3 way playoff for a US Open Championship. June 30th 1911 Vardon wins 5th British open at Royal St George's at Sandwich in 36 hole playoff defeating the former Open champion Arnaud Massy of France. Mr. Bruce Pierce putting out on 15. June 1911 "Colonial representatives" participating in the 1911 Open Championship include Mr. "Chick" Evans and Mr. John G. Anderson. There were not more than 1000 spectators at any one time due to the remoteness of Sandwich. Also the Open took place the week after the Coronation festivities of George V in London leaving everyone with no desire to be in crowds of any type. June 30 1911 Robert Simpson won the Western Open Championship at Kent Country Club, Grand Rapids Michigan. James Simpson was low medallist shooting a course record 71 in his 2nd round. July 1911 The Metropolitan Open Championship was won by Wilmington Country Club professional Gilbert Nichols. His score of 281 is a new record for 72 hole competitions. July 1911 After winning the Metropolitan Open Championship, Gilbert Nichols shattered the course record at Wilmington with score of 65. This is 3 strokes better than the previous record. July 3, 1911 Mr. William Sheehan won the Iowa State Championship defeating Mr. R. H. Rider 2 and 1 in the 36 hole final. Mr. Sheehan was also medallist for the tournament. July 15, 1911 Mr. Warren K. Wood defeated Mt. Walter Travis 1 up in the 18 hole final to win the Taconic Cup at Elwanok Country Club in Manchester Vermont. Mr. Wood was also low medallist. July 22, 1911 P.W. Whitmore from The Country Club defeats Chick Evans 1 up to win the Manchester Cup at Essex Country Club. Mr. Whitmore is one of two scratch players in Massachusetts. The other being John Anderson of Brae-Burn. July 1911 The United States Golf Association has suggested that you do not enter the Amateur or Open championships unless you think you have a fair chance to win. July 1911 The Stanton Heights Golf Club of Pittsburgh will be hosting its first professional tournament in September on its newly complete 18 hole course. July 1911 The Wing Park course at Elgin. Illinois has banned women from wearing high French heels on the golf course. July 1911 Robert P. Jones Jr. won the 1st Junior Championship of the Atlantic Athletic Club. He had little trouble in winning any of his matches, including the final which he won on the 15th hole. July 1911 The United States Golf Association and The Royal and Ancient announced they "are in perfect accord". July 1911 The Canadian Open Championship played at Ottawa Golf Club was won Charlie Murphy, the professional at The Royal Montreal Golf Club. August 1911 Fry's Magazine publishes the controversial "The Government of Golf; the Disease and the Remedy". August 1911 Harry Vardon's 1912 tour of Australia has been called into question due financial concerns. August 9, 1911 Alec Smith wins his third Eastern Professional Golfer' Association Championship at the Rumson Country Club, Rumson New Jersey. His previous EPGA's were 1908 and 1909. Herbert Strong of "I played the US Open alone fame" finished tied for 8th. August 11, 1911 J.J. McDermott US Open Champion, wins the Philadelphia Open taking home the $150.00 1st prize money. It was McDermott's second consecutive tournament victory. August 12, 1911 Walter Travis defeats R.R. Gordon to win the 12th Annual Tournament for the First President's Cup at the Ekwnaok CC in Manchester VT. The 1911 field considered the best assembled in 1911. August 1911 Lionel Munn won his 3rd consecutive Irish Open at Portmarnock. August 1911 Harry Vardon won the Open Championship of Baden-Baden Germany taking home the 1st prize of $500 of a total purse of $1250. It was also announced that the 1912 purse will jump to $2500 with 1st place being worth $650. August 1911 The Royal and Ancient's has announced Westward Ho! will be site to The 1912 Amateur Championship June 3-7. It is recommended that foreign golfers wishing to compete make their plans now as accommodations in the area are sparse. September 1911 The Mahoning Golf Club of Youngstown Ohio has hired H.H. Barker to lay out an eighteen hole links. September 2, 1911 Miss C. Painter defeats Miss A. Sanders in the finals to win the Women's Western Golf Association Championship. September 7, 1911 John G Anderson of Brae-Burn wins Massachusetts Amateur Championship at Essex CC in Manchester, Massachusetts. September 11, 1911 Thomas Sherman, son of US VP Sherman, fired a 75 to be low 1st day qualifier for the U.S. Amateur Championship. September 14, 1911 a bronze tablet is placed under the clock on Royal and Ancient Golf Club in memory of Tom Morris. September 15, 1911 The R. and A. announces that 153 British clubs requested copies of the 1910 updated rules while the U.S.G.A. requested 400 copies. September 16, 1911 H.H. Hilton of England (with help from the golf Gods) defeats Mr. Fred ("as fine a sportsman as ever lived") Herreshoff on the 37th hole to win the U.S. Amateur Championship. September 1911 The Michigan Golf Association announces the 1912 State Championship will be held at the Detroit Golf Club. September 1911 "Peanuts" Espinosa defeats "Long Jim" Barnes 2 up in the The Professional Tournament at Del Monte. 1st place paid $300. October 4, 1911 Scotland born professional George Duncan wins the 1911 Western Pennsylvania Open Championship. October 12, 1911 Young Francis Ouimet is low qualifier for the Fall Cup at The Country Club in Brookline. He is eliminated in the 1st round of match play by P.W. Whittemore. October 14, 1911 Miss Margaret Curtis wins the 17th annual U.S.G.A. Championship for Women. October 1911 James Braid wins the Autumn Professional tournament at Walton Heath. This year's event had a purse of $2000 an increase of $800 over 1910's money. November 1911 H. H. Hilton 1911 U.S. Amateur champion tells the London Daily Mail that American golfers "are not up to the standard". December 1, 1911 The public links at Jackson Park, Chicago, for the season which practically has ended, even for the un-terrified winter golfers the total number of tickets issued to players for the year 1911 was 98,790. December 2, 1911 The first Southern Open Championship played at Memphis CC has been won by Alex Smith. December 1911 M.J. Brady announced his plans for a southern and western tour. Efforts are being made to send him and J.J. McDermott to compete in the British Open next summer. December 1911 Construction has begun on Cuba's first golf course. December 1911 Brae-Burn CC, Newton Massachusetts recorded a record 15,457 official rounds played in 1911. December 1911 Hillandale Golf Club in Durham N.C. opened for play. It will be a year round course. It is estimated it cost $25,000 to build.